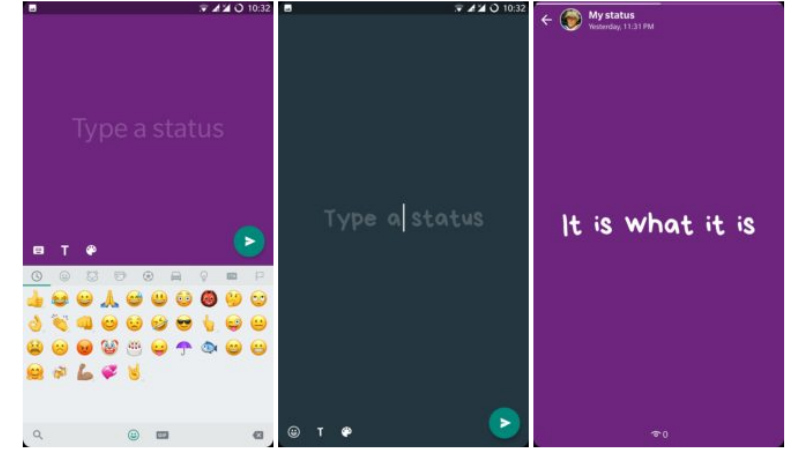 WhatsApp is rolling out a new feature that lets users write status updates with a colorful background. It’s pretty much identical to a feature on Facebook, and also allows users to add a link and choose a font for their statuses. Previously, you could only use photos and videos as a background. The number one instant messaging app introduced the option to create status updates with customizable colourful backgrounds, numerous custom fonts and ability to add clickable website links to status updates. Facebook began adding the colored-background statuses in December 2016. While garish at times, the feature was supposed to increase engagement among users. WhatsApp started testing the feature earlier this month before releasing it to all users today. The statuses disappear after 24 hours and can be added to WhatsApp’s stories feature — copied from Snapchat, and now available on Facebook, Instagram, and Messenger. Ephemeral messages, photos, and videos are all the rage and consistently pull in users, so flagship social media apps are touting the feature for obvious reasons. To customize Android users will notice a pencil icon just at the top of the camera (or add status) icon when you swipe to the Status tab of your messenger app. Clicking this pencil icon will initiate the status creation process which allows you select preferred font style and background color. WhatsApp will commence rolling out of the coloured status update feature today, August 22, 2017 and users need not download or re-install the WhatsApp messenger from the respective App store of their devices to have the have the new status update feature on their app. The new status update will be embedded automatically by WhatsApp through their servers.